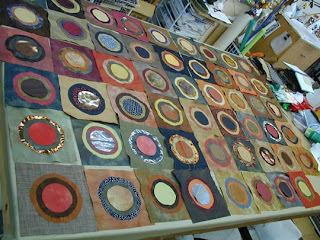 The purpose of this blog is share with others the processes involved in my favorite form of creativity- silk art quilts. The creative process itself is a fascinating thing. I am constantly amazed by it- both its simplicity and its complexity. I feel strongly that I am a better person since I truly started following my dream. Because of collectors--those who actually buy original art-- I am able to live my dream. I thank you from the bottom of my heart. You can see more of my work at my website http://www.rebelquilter.com/. This is an "in progress" photo of one of the quilts I did as a commission last fall. I have all the layers down but have not cut the blocks into quadrants. This week has been kinda unreal. Since my last post, my father, who I mentioned had had a stroke on Apr. 22ND has died. His memorial service was on the 7Th. The last while has been a time of re-orienting for myself as well as my mother. Thankfully, he went pretty quickly, considering the damage the stroke did. We are healing and moving forward- bit by bit. Good news came last week when I got a call from Kim Ritter. 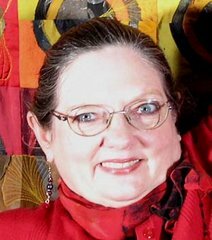 Unfortunately for her, her son is having some tough health problems and she opted to step down from her upcoming workshop at the Studio Art Quilt Associates national convention. Her topic was going to be "How to go professional without tripping over your feet." In her stead I have been asked to teach it. Wow! I am SO honored! So for the last week I've been re-working the workshop I taught in February at the Springfield Visual Arts Alliance. I'm trying to figure out how much I can cover in 50 minutes and still sound knowledgeable. I'll be teaching it 4 times...and getting to go to the Quilt National opening as well. There is much synchonicity going on here. The only reason I was able to help Kim out was because I had cancelled all my shows (due to Dad's health) and the weekend was free. After the intensity of the last few weeks I am thrilled to have the chance to re-connect with many firends who will be at the conference as well as get a jolt of inspiration always prevalent at Quilt National. Plus it will be a large boost on my resume' for teaching on a national level. I am realising that there seems to be a niche I might be able to fill in the teaching market. After I finish the 2 commissions that have been interrupted by my dad's scene, I am really looking forward to playing with collagraphs. I have had an interest in printmaking for a while. My personal fascination has been with printing on fabric. I saw work done recently using plexiglass and cardboard and printed onto watercolor paper. The process is so freeing. I'll think it'll first turn up on my backs and as I develop the techniques you may find them on the fronts-- or as the quilt itself in framed work. Since I don't have any shows scheduled I'll be able to focus on it sooner than I might have previously. You two who have commissions outstanding- I'm on it! The explorations of Rebel Quilter, Susan Leslie Lumsden, as she plows her way through the world of creating art and marketing it. To subscribe to my blog...it's free! There are 2 ways to get notification of updates of my blog. The first will give you the update in the form of email. Go to www.feedblitz.com and just fill in http://rebelquilter.blogspot.com to subcribe plus your email address. I promise your information is safe with me and won't be sold or used irresponsibly. The second method is if you have a newsfeeder on your computer. Most of us do not have this or if we did, we don't know it. For that option simply scroll down to the very bottom of my blog and select the hot button for subscriptions. My passion for cooking started early and I have always been an adventurous cook. I have traveled extensiviely around the country and know just what we've been missing here-- a dining option that focuses on fresh locally sourced ingredients. I'm believe in celebrating each new ingredient as they come into season and am looking forward to sharing that celebration with you.